The House is composed of two or three room apartments equipped with double rooms and twin rooms, kitchen, porch with adjacent tables and chairs for al fresco dining. Has a swimming pool 17 x 7 m (prof max 2 m – min 1 m) equipped with loungers and umbrellas, hot shower, barbecue, pizza oven, table tennis, parking. Surrounded by five acres of park and garden is the ideal destination to reach in a short time the most beautiful art cities of Tuscany. Only 35 miles from the beautiful beaches of Follonica and Punta Ala. In the surrounding area and especially in Autumn possibilities for collecting chestnuts and mushrooms. During the many food festivals you can taste and buy local products are: wine, extra virgin olive oil, cheese and salami of Cinta Senese. You will also find various paths for trekking and mountain biking. 2 km far from the house you can visit the small but charming village of ancient and fascinating Leccia its medieval history. 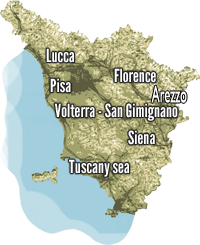 On the way to Leccia a left fork leads to the site an important Etruscan-Roman spa town of the third century. BC in course of excavation. C1007-2/3 : apartment BILO (2 people +1) composed of double bedroom, bathroom with shower on first floor; kitchen area on ground floor complete with accessories and TV with adjacent porch with tables and chairs for outdoor dining. C1007-1/4/5: apartment TRILO (4 people +1) consists of a double room, twin room, bathroom with shower on first floor; kitchen area on ground floor complete with accessories and TV with adjacent porch with tables and chairs for outdoor dining. The total price includes: linen kitchen: kitchen towels, cloth, towels (towel, medium, small per person), bedding (pillowcases, sheets, pillows, blankets) cooking gas, electricity, water, WI-FI, swimming pool a 17m x 7m Hmax 2 m – Hmin 1 m mid may – mid september).